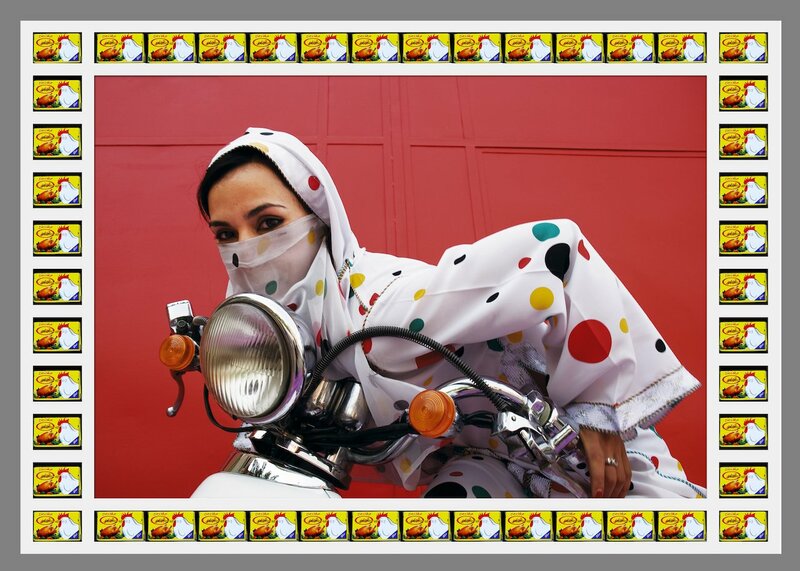 He is perhaps best known for his colourful photographic portraits, including the Kesh Angels series, from which there will be several new works in the exhibition. 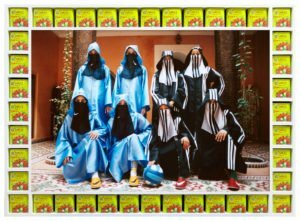 Blending the glossy aesthetic of a fashion shoot with Moroccan tradition and street culture, these witty and poignant images, although outwardly light-hearted, challenge Western perceptions of the hijab and female disempowerment. Another new body of work in the exhibition is My Rock Stars: Volume 2, a nine screen installation of distinctively dressed musicians. Each musician occupies an individual screen and takes it in turns to play their instrument, while the other performers turn to watch. The clothes and brightly patterned backdrops in each screen have been carefully selected by Hajjaj to highlight each player and their individual performance. Visitors are provided a seat on a customised sofa to watch the performance and listen to the music which travels throughout the whole exhibition.